Q: HOW LONG DO YOUR CAKES/CUPCAKES/COOKIES LAST? A: Our cakes, cupcakes and cookies contain no preservatives, therefore they arebest consumed fresh. If well kept, 2 to 3 days. For cookies, do store them into an air tight container to preserve freshness maximum 4 to 5 days. 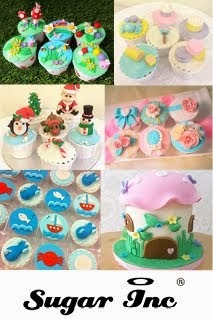 Q: HOW DO I STORE FONDANT COVERED CAKES/CUPCAKES/COOKIES? A: Storing fondant covered cakes, cupcakes or cookies in refrigeration extends the shelf life. However, once removed from the fridge, fondant will start to 'sweat' (condense) and will cause the fondant decor to wilt. Therefore, chill your cakes only when the party is over or when you do not need it to look their best. A: Our cakes do not come by weight, they go by the number of guests the cake needs to feed, reason being the fondant decor itself will carry some weight. We not replicated certain characters due to strict copyright restrictions, therefore we would need you to provide us with the figurines/ toppers. It would be helpful if you could let us know your cake design preference so we can execute it to the best we can. Q: HOW IN ADVANCE SHOULD I SUBMIT MY ORDER? A: For big events such as weddings or birthday parties (e.g. Bespoke Tables or Baby Full Month gift sets), at least 5 to 6 months in advance. As for cupcakes or cookies, 2 to 3 weeks in advance will do. Q: HOW DO I GO ABOUT PLACING MY ORDER? A: Please refer to the "ORDER" page on this website to include all the details and to email us. Once we have responded with an available baking slot, we would require a 50% deposit for your order to book and confirm your baking slot. Deposit can be made through internet banking or ATM transfer to our DBS Account. The remaining balance, can be made 2 to 3 days prior to your event. A: Delivery to any other location in Singapore is available at $25.00 - $35.00 per order per location. Please note we do not deliver to certain parts of Singapore, e.g Sentosa, Jurong Island or Tuas. There is a free delivery for orders of $200.00 and above. Self-collection is only made at Redhill MRT and is subjected by appointment only.